Our product range includes a wide range of infrared sauna (sek-cp-1) and portable infrared sauna. 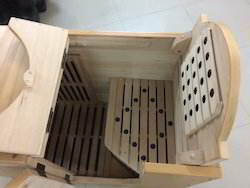 We are the prominent manufacturer, trader and supplier of Royale FAR Infrared Sauna (2- Person). The offered infrared sauna is designed to detoxify the body by giving required amount of heat which leads to a healthy life. By keeping all the quality measures in mind, this sauna has an excellent interior with warm Hemlock lining and is widely used in spas and massage centers for its beneficial and safe design. 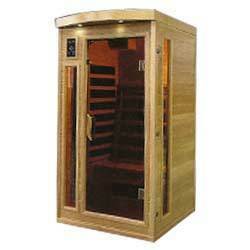 Royale FAR Infrared Sauna (1 Person) offers complete sauna experience to 1 person. These days we all have busy lifestyles and taking time out to relax and look after our bodies seems to take second place. But thanks to a new development based on old-fashioned remedies and new technology, help is at hand in the form of the Wooden Royale Far InfraRed Sauna. Detoxification: Removes harmful toxins and heavy metals from the body. Wooden Portable Far InfraRed Sauna stimulates the sweat glands. Boosts Circulation: Increases Blood Circulation and reduces blood sugar level to control diabetes. The use of sauna provides cardiovascular conditioning and involves substantial increases in heart rate, cardiac output and metabolism resulting in increased overall cardiovascular fitness. Controls Weight: Burn upto 600 calories in 20 minutes session through profuse sweating. Pain Relief: It has been proven that heat reduces pain sensation by direct action on both free-nerve endings in tissues and on peripheral nerves helping in arthritis, muscle spasms, joint stiffness and pains. Temperature Range & Power : 18°C – 65°C / 64.4°F – 149°F / 850W. Heating Type : Infrared Carbon Heater with tourmaline stones. Looking for Wooden Sauna ?